Perhaps if you’re a geezer like this reporter. But not so funny if you’re a boy or girl who doesn’t own a winter coat for those bitter walks to school. Keeping children safe and healthy plays a paramount part in providing a quality education. Helping those less fortunate by providing a new winter coat is the mission of Operation Warm. Operation Warm touched down in Baltimore this morning at Morrell Park Elementary and Middle School. 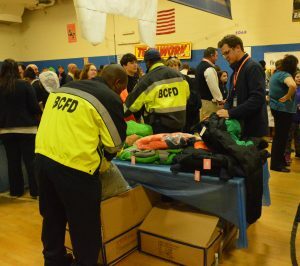 Together with Baltimore City firefighters, police officers and a team of employees from heating contractor Horizon Services, Operation Warm distributed almost 500 coats to Baltimore children. 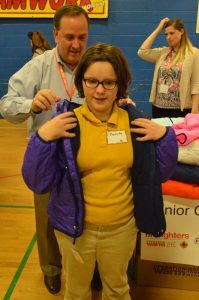 Since its inception in 1998, Operation Warm has provided new winter coats to more than 2 million children in need. In 2012, the organization was joined in its effort by The International Association of Firefighters (IAFF), forming a localized program: Firefighters for Operation Warm. Tom Nosek, 2nd Vice President, IAFF Local 964, called the partnership, “a win-win situation”. “We’re here today with local firefighters and members of the Fraternal Order of Police. By distributing the coats in this manner, we’ll help keep kids warm this winter while warming our own hearts as well. It’s also a great outreach to the community. There have been times recently where police officers have not been seen in the greatest light, but they do a fantastic job. Nosek said the allotment for children at Morrell Park is just one of several planned for this school year. Joining local firefighters and police officers for the coat distribution were 45 employees of Horizon Services. “This is the fourth time we’ve been involved with Operation Warm, but it’s the very first time we’ve actually had volunteers here to give out the coats. Previously, we simply wrote a check to support the organization”, said Mark Aiken, Senior Vice President of Horizon Services. 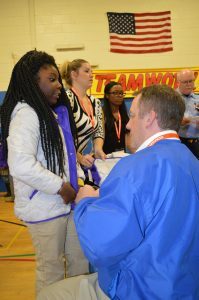 Principal Michele Johnson told the Baltimore Post-Examiner she is extremely thankful for Operation Warm, and is very pleased to have the Baltimore City Fire Department and Horizon Services on board. New Jersey native Garielle Harvey boarded a pre-dawn chartered bus in Wilmington, Delaware to help with the winter coat distribution. Mike Heiner, another Horizon volunteer, also rode the bus from Delaware. Heiner was stationed at one of the tables, helping girls sized 4 – 6. Pride of ownership was only part of what this reporter observed as the exuberant children selected their new poly-filled nylon jackets. We asked Aiken if he sees a pleasant irony in having heating professionals hand out winter coats? “We love it when it’s cold, but we want the kids to be warm, so for us, it’s a perfect, perfect fit. You know, I’ve talked with some of my employees here today, and they are so emotional about giving these coats out to kids that they are crying. They really didn’t have an understanding of how unfortunate some people are until they got down here where life is hard. “But it can always be worse. You can contribute to helping children throughout Baltimore by donating to Baltimore City Fire Officers for Operation Warm at www.operationwarm.org/BaltimoreOfficers.